TWICE is the first girl group to top Melon music chart this year since its reformat. JYP Entertainment’s representative girl group TWICE has hit its eighth home run in a row. With the release of “What Is Love?” from their fifth mini album, the group took the no. 1 spot, once again, after they released the song on April 9. Last year all of Korea’s major music streaming sites including Melon, Genie, Mnet, and Naver Music, underwent a reform. According to officials, their aim is to maintain stable chart aggregation and prevents manipulation. One of the biggest changes included preventing songs released at midnight from entering charts until the afternoon of the same day. However, songs releases between 12 pm and 6 pm KST, are immediately reflected on charts. The changes were implemented on February 27, 2017. Whereas there have been some major releases from there girl groups, TWICE is the only one to reach and hold the no. 1 spot this year. In February Red Velvet released their sultry song “Bad Boy” but was barred from the top spot due to boy group iKON’s astounding multi-week reign. 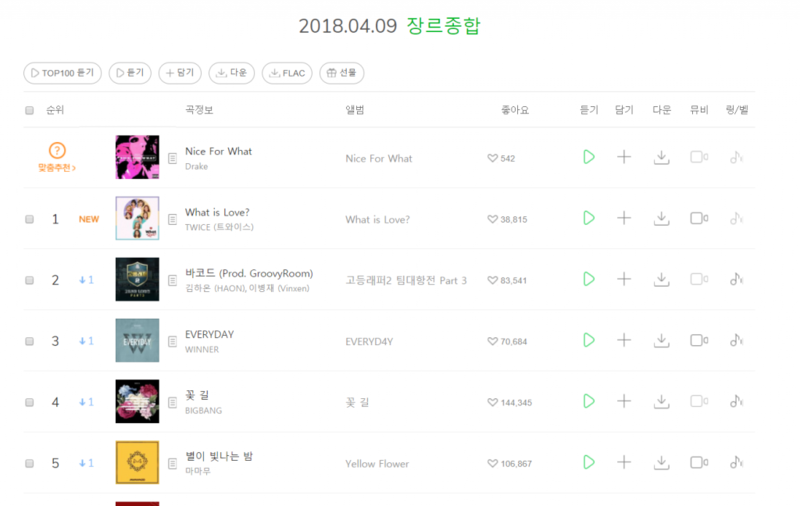 Further, vocal group MAMAMOO’s song “Starry Night” which dropped on March 8, was shortly followed by BIGBANG’s song “Flower Road” on the 13th. “What Is Love?” is a dance song the explores the curiosity and imagination of girls who learn about love from books, TV shows, and films. More, the song features a bright melody and rhythm with an uptempo dance and trap beat. At the time of this article’s release, the music video has 19.7 million views.